Great for your next awareness event. 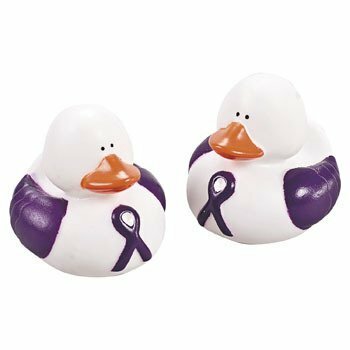 Purple ribbon rubber duckies are a unique addition to your awareness decor or fundraiser. This listing is for a 12pc (one dozen) pack of ducks. Each duck is 2". Please note that these rubber duckies are not weighted ducks, meaning they do not float upright.